+ Exposure to Asian region with rapid middle class growth. + Franchise taker of world-renowned brands in selected markets (IKEA, 7-Eleven, Starbucks). 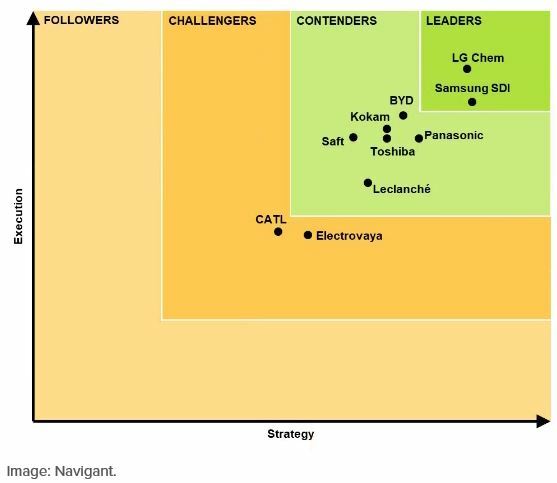 + Joint Ventures with highly successful companies (Maxim’s, Yonghui). + Strong and majority owner in Jardine Group, with newly appointed CEO for Dairy Farm. + Counter cyclical to property market, lower rent means higher margins. – Competition severe in grocery and health, now online is also a new threat. – Revenue increased rapidly in several segments 2006-2012, but margins started to deteriorate the years after. Turn-around still unsure. – In the hands of property companies who can sometimes aggressively raise rents. For people familiar with the Asian region many of these brands represent daily life of grocery, food, snacks and health purchases. As can be seen in the table above, there is a heavy tilt towards Hong Kong and Mainland China. It’s not fully clear from the annual reports, but Dairy Farm has struggled somewhat with it’s operations in some South East Asian nations so far. This is also reflected in the Net closures in some of these markets. Dairy Farm recently agreed to acquire the remaining stake in Rustan and hence forth own 100% of Rustan. Of the above Subsidiaries and Associates Yonghui Superstores and Maxim’s are the two major holdings. Yonghui is listed in China and PT Hero is listed in Indonesia. Although listed in Singapore, Dairy Farm is mainly a Hong Kong based company and naturally it’s business has a larger portion of sales in Hong Kong. For a overview of the history I suggest reading the timeline on the homepage (Dairy Farm Company History). Dairy Farm belongs to the Jardine group, which holds a 78% majority shareholding in the company. The Jardine group also has its base in Hong Kong and has been around almost as long as Hong Kong. With the growth of Hong Kong they have expanded together with the city. The Jardine Group spans a wide number of sectors. It’s relevant to have some basic understanding of the other companies in the Jardine group, because they will often work in co-operation. For example the Jardine Group owns a lot of property. The grocery stores, restaurants and other businesses of Dairy Farm is often found in buildings owned by the Jardine Group. This below picture gives an overview of the main entities within the Jardine Group. The cross holding structure of the two main entities in blue, dates back to the 1980s. 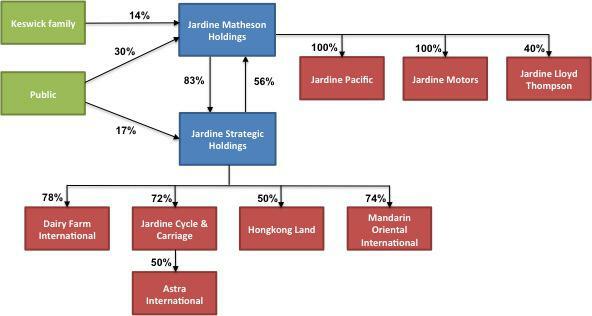 At the time Jardine Matheson and Hongkong Land bought shareholdings in each other as protection from hostile acquirers. The main threat was Li Ka-Shing and his C.K Hutchison Holdings which acquired A.S. Watson Group, which is one of the main competitors to Dairy Farm. As can also be seen the Keswick family holds position in Jardine Matheson and effectively controls the Board of Jardine and by that also Dairy Farm. Ben Keswick is the Chairman of Dairy Farm’s board of directors. In total four members of the Keswick family is on the Dairy Farm board. Graham Allan who led the company for five years stepped down in August this year. Looking at the operations of Dairy Farm, Graham has not really done an outstanding job, I think that is the main reason he is being replaced. Ian McLeod another veteran is replacing him, one can just speculate if he will be able to “turn things around”. But I see it as a positive that someone new comes in after lackluster performance for the last 4-5 years. I think its worth to mention, that Asia is not like the US or Europe when establishing a business. Hong Kong for example could probably for an outside investor seem like a very free economy, with low barriers to entry. This is very far from the reality. For example the grocery stores Welcome and ParkNShop has reigned in a fairly undisturbed duopoly in Hong Kong for many years now. Back in the 1990’s the giant Carrefour tried to establish itself in Hong Kong seeing that margins where very healthy in the city. A few years later they gave up (Carrefour Bails Out). They could neither secure a fully working supply chain or locations to expand their operations. Why? Because the property are often controlled by Jardine Group or Hutchison, which are the ultimate owners of Welcome and ParkNShop. In the same way they control much of the food distribution. In a city like Hong Kong there are many examples of businesses that are protected due to vested interests from business owners, who are allowed to influence politics. The same goes for many other markets in Asia, where without local market “knowledge” it will be very hard to succeed. For the interested reader who wants to understand more of the company dynamics in Asia I highly recommend the book Asian Godfathers. For Dairy Farm this means that the company in some markets are partially protected from the market forces and could potentially enjoy higher margins than otherwise would be possible. But how these profits are split between Property owners, distributors and other parts of the organisation is of course not fully clear. For example Jardine Group could slightly skew the rental paid from Dairy Farms shops & restaurants and dramatically affect the groups profitability. But I don’t see any major concern on this point, rather it is a positive to be on good terms with your landlord. This duopoly situation in the case of Hong Kong is highly unlikely to change in any foreseeable future (to the detriment of consumers). But as we will see from the financials later, Dairy Farm has struggled to uphold previously very strong margins. Dairy Farm gives exposure to the rising Asian middle and upper-middle class. This surely is a tailwind for the business as a whole since this segment is more or less destined to grow. That said, some parts of Dairy Farm’s business face especially severe competition from online options. Especially the Health and Beauty segment seems to be suffering from this. 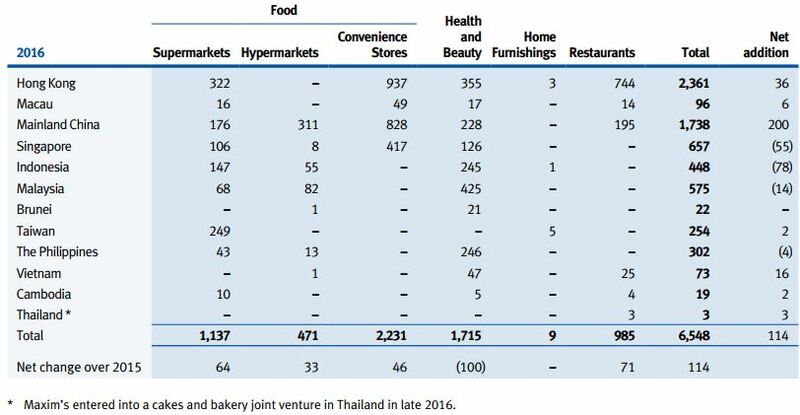 There has also been strong competition in the grocery segment, many large operators like Tesco and Carrefour has also believed in the rise of the Asian middle-class and done large investments in the region. Other areas like Maxim’s restaurants are doing very well, it’s a general trend to eat less at home and thanks to take-away services like Deliveroo, restuarants can increase sales volumes even further. So some disruption is positive, others are negative. Unfortunately Dairy Farm does not fully break down Revenue and Profits both in the segment and country dimension, but we can at least understand the different business segments. This segment is by far the largest, measured by Revenue for Dairy Farm. But being such a low margin business it does not drive Operating Profit to the same degree. Although my discussion about duopoly above, this segment has really struggled to uphold its margins. 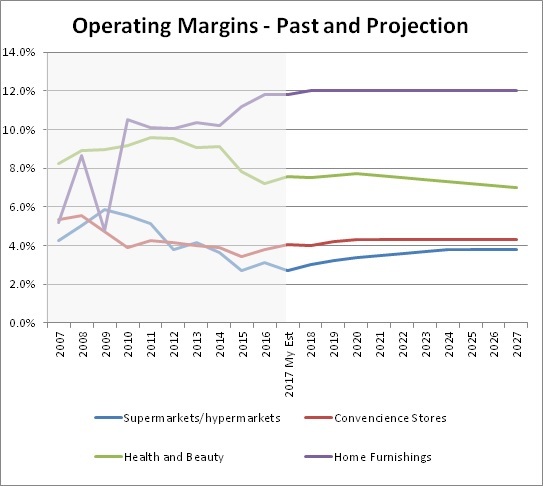 I made a small peer analysis, to see what Operating Margins are for other grocery store operators around the world. Although every market and country is different, it gives an overview of what can be expected in this segment. Looking at large developed markets like the USA and France, what we expect in a good year is slightly above 3% Op Margins. Whereas more niche markets like South Africa and even Australia is showing signs of margins above 5%. It’s quite extraordinary that the difference is so large. The closest comparison to Dairy Farm would Sun Art. If Sun Art is a measure of structural changes there has been some margin deterioration in Asia, but not nearly as much as Dairy Farm experiences. 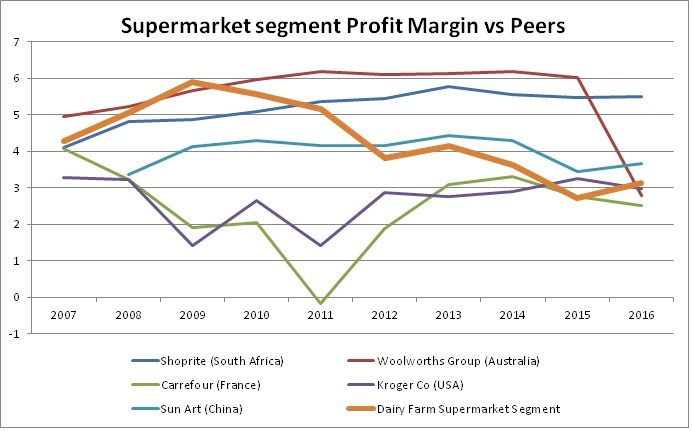 Dairy Farm used to be best in class 2009, now its rather “worst in class” and margins has deteriorated down to returns in line with more mature markets. I believe this is partly structural, but also to some degree mis-management from Dairy Farm’s side. Perhaps the new CEO would be able to lift margins back up to 4% over the coming years. It’s not easy to call a turn-around in margins, but I do feel there is a skewed probability to the upside, since margins are already at lows, compared to peers. One could also argue that less developed markets should have higher margins on grocery business, why? It is seen more as a luxury and status product to buy groceries in a nice store compared to a busy wet-market. 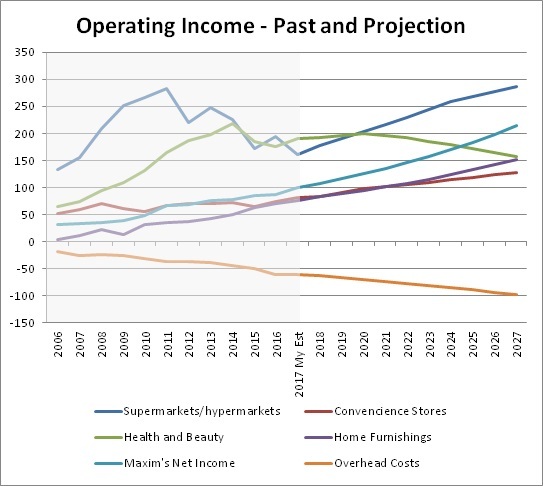 Given the status component, consumers should in theory be less price sensitive, which would lift margins, as is the case for Shoprite in South Africa. Some markets, like Hong Kong is fairly saturated in terms of growth potential, whereas countries like the Philippines where Rustan only operates about 60 stores, there is still a lot of potential to grow. The competition varies across the region and the success of Dairy Farm’s subsidiaries. Indonesia and Malaysia with large populations are really markets where one could hope for future growth. But these markets are also where significant competition has been seen and operations are struggling. Overall one can say this segment has been the problem area for Dairy Farm for some time now and is the main reason why we are trading far below historical highs share price wise. 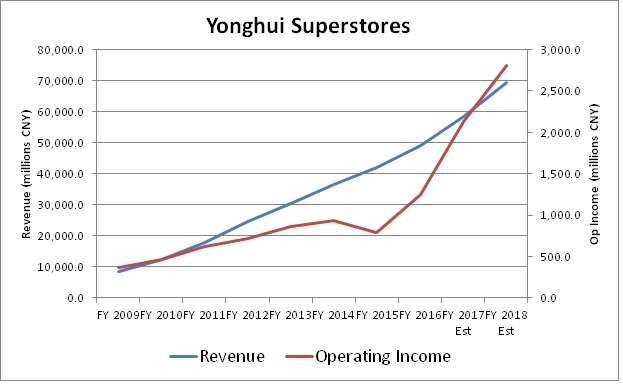 One particular company has been doing very well though and that is Yonghui Superstores. This Chinese supermarket chain was not included in the Operating Margin comparison above. Yonghui which Dairy Farm owns 19.99% of deserves a section of it’s own. This has been a very successful investment for Dairy Farm. The initial holding was bought below 4 CNY per share in 2014. In 2015 JD.com wanted a 10% stake and to protect its ownership share Dairy Farm added to it’s investment. After very strong performance Yonghui is today trading above 10 CNY per share and the MCAP of Yonghui Superstores is about 14.5 bn USD. With Dairy Farm’s MCAP slightly below 11 bn USD, this has become a very significant holding for Dairy Farm. 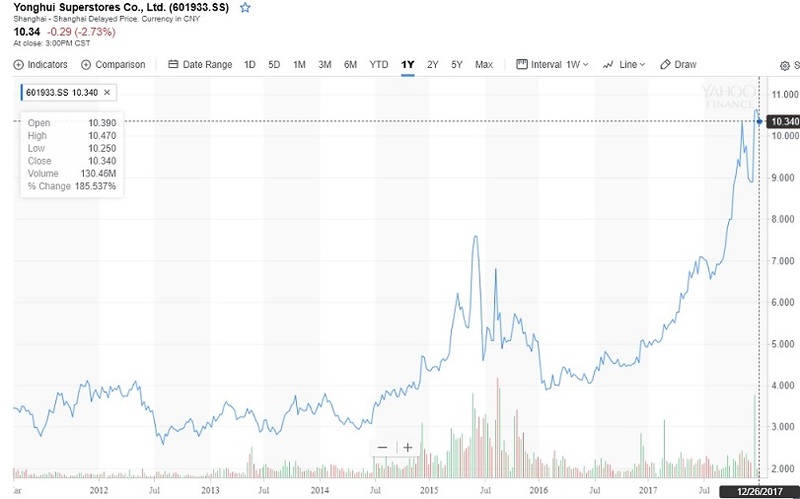 Yonghui is trading at pretty aggressive multiple, recently Tencent announced they are also taking a 5% stake in Yonghui and the stock surged further. So now we have two Chinese internet giants who wants to co-operate with Yonghui, probably with the same thoughts as Amazon has with its Whole Foods purchase. I think this also shows some of the unlocked values for the future in other parts of Dairy Farm’s supermarket holdings. So for grocery stores online is not just a threat, there is also a potential buy-out from the Tech industry, who can’t handle the delivery chain of fresh food products without the established companies. Yonghui has transformed somewhat over the last years. 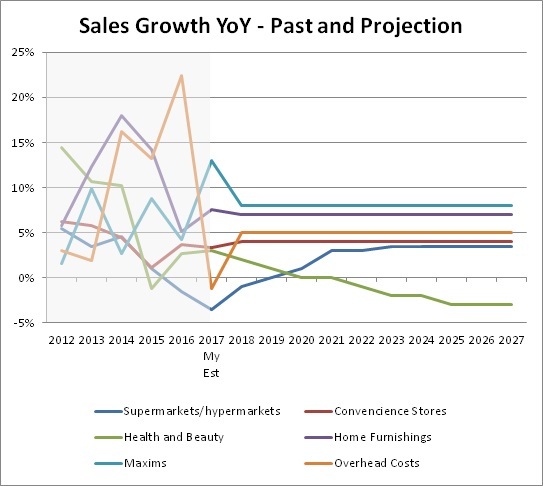 From running massive 5000 m^2 hypermarkets, the company launched smaller 500-1000 m^2 Super Species stores. 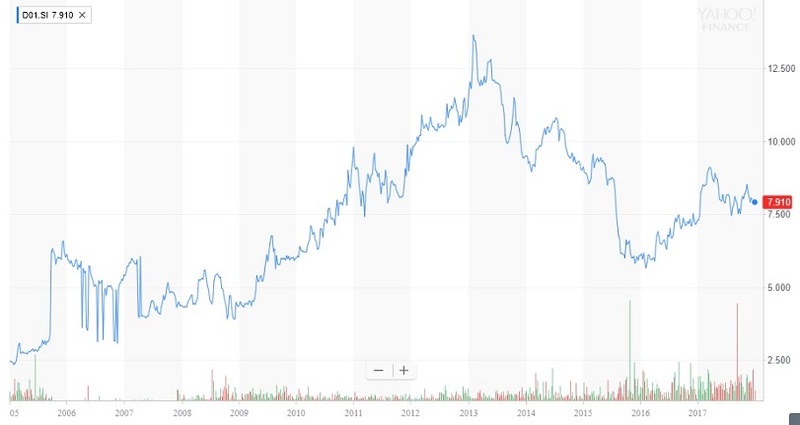 The company has grown very impressively and one can say with benefit of hindsight that the China stock market crash in 2015 created a very nice buying opportunity below 4 CNY per share. Read more about the companies change in profile in this article: Yonghui Superstores dishes up new brands to satisfy customers. Although Revenue and Operating Income has climbed impressively, the stock is now trading at very stretched multiples, trading more like a Tech company than a grocery retailer, with a P/E above 50. This might not be sustainable valuation short term, but Yonghui gives Dairy Farm a strong foothold in the quickly expanding Chinese market. As we also will see later, the Dairy Farm share price is probably not fully discounting the current market valuation of Yonghui. 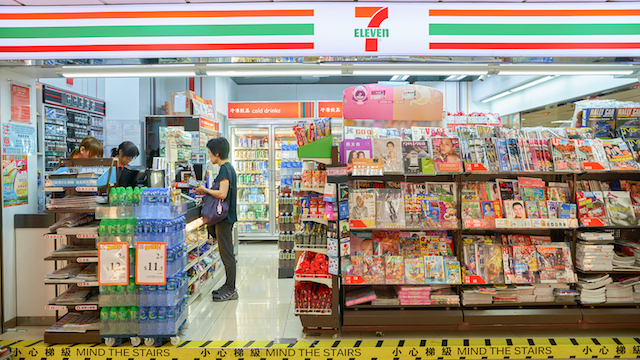 Dairy Farm operates convenience stores in Hong Kong, Macau, Singapore and Guangdong Province under license from 7-Eleven Inc., with a 65% interest in the business in Guangdong Province. 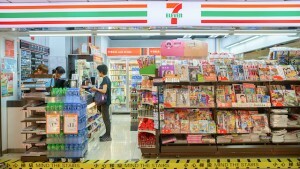 Many (in HK roughly half) of the 7-Eleven outlets are run as franchises. The ultimate owner of 7-Eleven Inc is Japanese listed Seven & I Holdings Co. 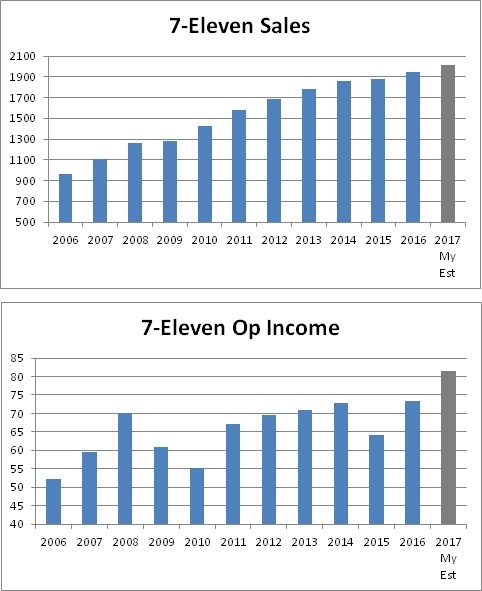 The 7-eleven business has also struggled with margins for a few years, but the latest half year figures has shown early signs of a turn-around. Dairy Farm contributes some of the profit increases to a change in stores to more ready to eat food. In the annual report they state: “Ready-to-Eat (RTE) food offerings continued to improve with over 10% year-on-year sales growth across the Group, which was double the rate of overall growth in the convenience store business.” Another source of growth is in mainland China, where the number of 7-eleven stores has grown from 550 to about 900 in 5 years. Having first hand experience from these stores I think this is one area which is not threatened by the onset of online. This is actually the perfect complement to buying staple products online. It’s also caters to the modern big city life, where you don’t have time to queue up to buy a bottle of water or some snacks. So you are willing to pay up perhaps up to double to price compared grocery stores for the same goods, thanks to its convenience. It is also an area which benefits from tourism, since tourist are even less price sensitive when visiting a city. Everyone who travels to Hong Kong / Macau / Singapore and walks around the city, might take a quick stop into the 7-eleven to buy some tissue paper and dry away some sweat or something to drink. Especially in Hong Kong it is also a very popular venue for buying chilled alcoholic drinks, it’s become somewhat of a phenomenon in party district Lang Kwai Fong to go to “Club 7” and hang out on the street drinking cheap beer from the 7-eleven store (to the frustration of bar owners next by). Consist of the brands Mannings (Hong Kong & Macau), Guardian (Cambodia, Indonesia, Malaysia, Singapore & Vietnam), Rose Pharmacy (Philippines) and GNC (Hong Kong). Although I visited the Mannings stores many times, it’s still a bit hard to describe what the customer offering actually is. 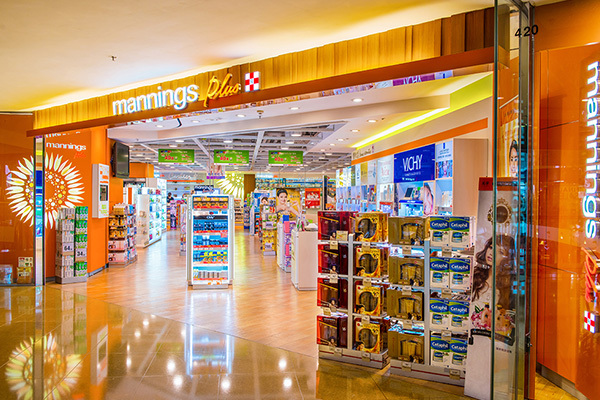 A regular Mannings store is like a Pharmacy in other countries, but without the prescription medicines. Meaning they focus on selling food supplements, creams and pills for smaller health problems, skin-care products, as well as beauty products like hair coloring, cosmetics etc. They also operate Mannings Plus, which also has the pharmacy part where you can pick-up subscription medicines. As is the case with grocery stores again Li Ka-Shing’s empire is the main competitor also in this field, with their Watson stores. For Groceries Dairy Farm has the lead on Li Ka-Shing’s group, but for these types of stores Watson is the clear dominant player, with 4 times as many stores in the region. For store sales in Hong Kong visiting Mainland Chinese tourist have also been an important customer group and when tourist numbers started to dwindle during 2014 sales suffered at the same time as rents continued to surge. Mannings/Guardian is the area I’m most worried about in terms of future online disruption. It’s very easy to order toothpaste, shampoo, sun-screen or food supplements online instead of visiting a Mannings store. Especially mainland Chinese are today used to ordering more or less anything on Taobao. On the other hand, I have myself been an early adopter on buying items online, started with electronics and now buying clothes, shoes etc online. Judging just by my own behavior I have not started to order my multi-vitamin pills online, it’s not really worth the hassle, although I could save a few USD. But for these types of shops female shoppers are more important and a lot of the products they would buy in Mannings are cheaper online. Looking at store numbers, with a net closure of 100 stores, this also speaks of a challenging market. But this cost control closing loss-making stores has also improved the bottom line, which saw a turn-around in the latest semi-annual report. All this being said, Operating Margins in this segment is still much higher than for grocery and 7-eleven stores. IKEA operates in Hong Kong, Taiwan through Dairy Farm and in Indonesia through 84% owned listed PT Hero. This has been a fantastic franchise for Dairy Farm. Starting off in small scale in Hong Kong, it did not really tip the scale on Dairy Farm’s bottom line. But with time and opening of stores both in Hong Kong and later Taiwan and Indonesia it is now making a significant contribution to Dairy Farm’s total Net Income. 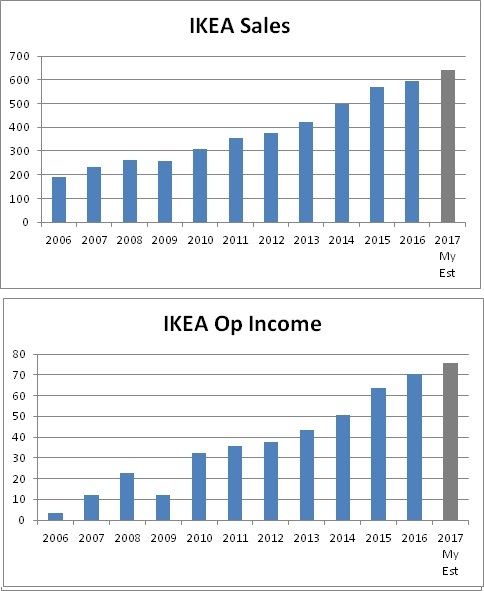 And judging by IKEA’s success in other markets I think this is something that just will keep growing with Asia’s middle class. The IKEA concept is actually even nicer in Asia than in many western countries. In the western world IKEA is located in the outskirts of the suburbs with huge parking lot where people desperately try to squeeze these brown flat packages in the back of their cars. Arriving home then comes the daunting challenges of following the instructions to assemble all of the products. In Asia the concept is much neater. The stores are smaller and located more centrally, you can walk around and look and feel on the products. With the cheap labor costs in Asia you can then order home delivery for free and by adding 10% on the price they will even assemble the products for you (and they are very efficient doing it). It’s so practical and price wise unbeatable for what you get, so its hard to find a single home without IKEA products. I think this a gem to have in the portfolio of products and I expect it to over the long term keep increasing Revenue and profits steadily, the biggest risk if the franchise would be renegotiated for some reason. Is a family run restaurant business from Hong Kong owned 50/50 by the family and Dairy Farm. More recently they have also expanded their restaurant operations to Mainland China and a few outlets in Macau. Except running many of the most popular local restaurants, Maxim’s group has also managed to sign several important license agreements for brands like Starbucks Coffee, The Cheesecake Factory, Genki Sushi and IPPUDO Ramen. The most recent such agreement is the launch of Shake Shack in Hong Kong during 2018. Starbucks has become somewhat of a status symbol in Asia, a place to see and be seen. In Hong Kong Maxim’s run the Starbucks brand, but unfortunately Starbucks in China is owned by Starbucks themselves. But there are other untapped markets in terms of coffee consumption. Maxim’s is now opening Starbucks stores in Vietnam and Cambodia. Knowing Hong Kong very well I can myself in somewhat Peter Lynch fashion say that many of Maxim’s restaurants are among the most popular in the city, with long long lines around lunch and dinner time. The explanation is pretty simple, they provide good tasting food at a price point that most other restaurants who don’t belong to a big group like Maxim’s struggle to match. 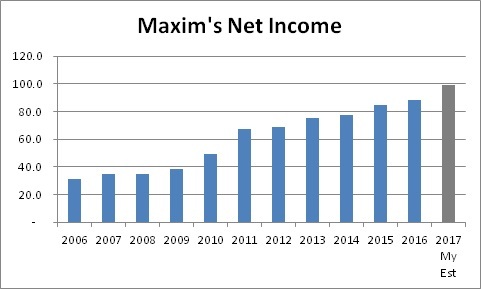 The track-record is pretty amazing for the group, providing Dairy Farm with Net Income CAGR of 11% over a 10 year period. I see several reasons why growth will continue on this trajectory. Firstly the in-roads in China has been successful, for example opening a Cheescake Factory at Shanghai Disneyland. The other being home food delivery growing strongly in the region, which will benefit restaurants in general. Obviously tourist numbers entering Hong Kong will also greatly affect Maxim’s future. One should mention that Dairy Farm experienced accounting issues in 2012 in it’s Giant operations in Malayisa. Whistleblower reveals accounting blip in Dairy Farm’s 2H12 results. One might argue that an added risk premium is warranted for these type of things, which probably are more common in emerging markets where Dairy Farm operates. From what I have seen Dairy Farm takes this seriously and has their own internal auditors assessing their different companies. I’m not particularly worried about this happening again. 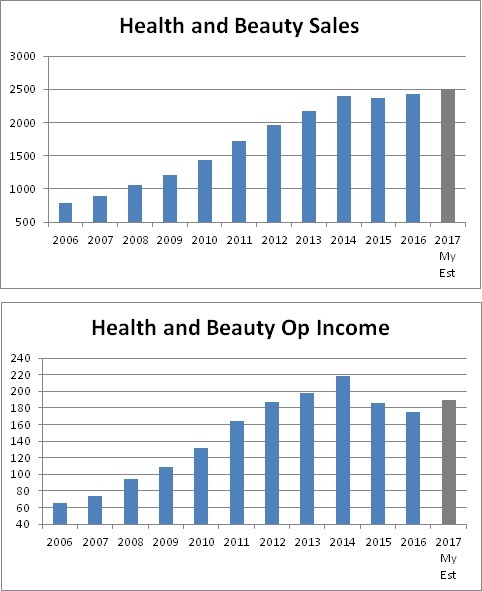 Looking closely at the graphs above, I’m expressing a fairly bearish view on the Health and Beauty segment going forward. 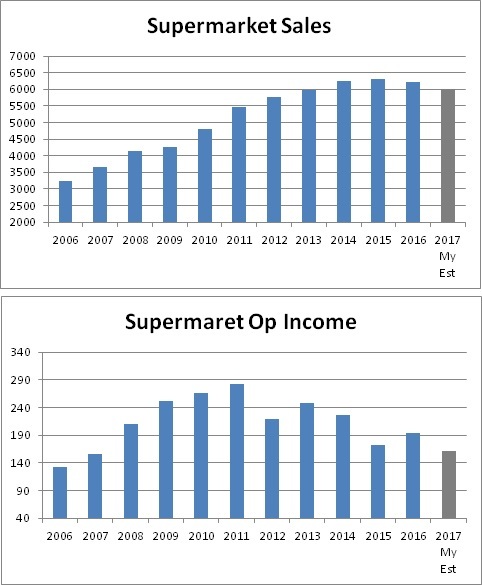 The Supermarket and 7-eleven stores I believe will show a slight recovery in margins and otherwise grow with the regions fairly high growth rates. 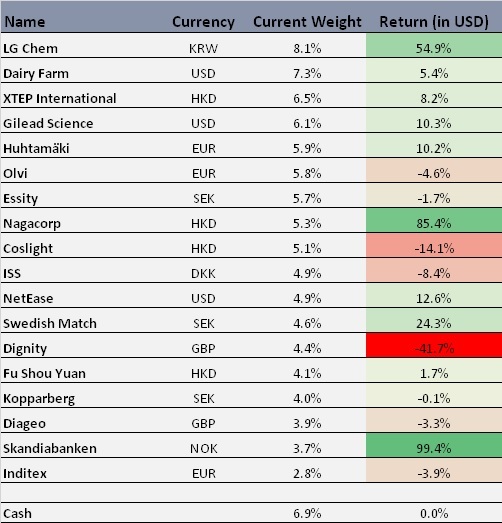 The ones that will really play catch up in terms of generating bottom line profit is Maxim’s and IKEA which I project has a very positive future within the group. This gives me a fair value of these Dairy Farm operations of 8.78 USD per share, versus latest share price at 7.91 USD. But that is excluding Yonghui holding, which is currently worth 2.23 USD per share, giving it a total value of 11 USD per share. For the first six months of 2017 Yonghui produced for the first time meaningful Net Income to Dairy Farm, at 31.1 MUSD, putting it in-line with IKEA in terms of profit generation. But the market is valuing Yonghui to extreme multiples currently. Dairy Farm’s share of Yonghui is currently worth about 3bn USD, which translates to 2.23 USD per Dairy Farm share. So adding that to the value of the rest of operations 8.78+2.23=11.01 USD per share. I’m not sure if I want to fully discount the quite aggressive current Yonghui valuation, but that is how the market currently values it. So from that perspective Dairy Farm is worth 11 USD per share. I find this valuation gap to my fairly conservative projections attractive. Another way to look at it is buying Dairy Farms core business, which I get at fair price with Yonghui Superstores, which is a major holding, for free. As the population in the Asian nations becomes more affluent, the habits to acquire food will change. From more simple groceries shopping in out-door wet-markets, to clean air-con centers with a wider variate of products, especially offering imported products. This is something the western world take for granted, we usually don’t even have local out-door markets easily available anymore. But for a up and coming Asian family this is a big deal and also related to status. We afford to buy our food at the luxurious food store with high quality products. Same goes for Maxim’s restaurants in Hong Kong and China, where when you become richer can afford to eat out more, instead of cooking at home. Deliveroo and other food delivery services are also important explanations to why restaurants now can serve and reach a much wider base of customers from a small well located restaurant. IKEA in the same way upgrade peoples homes with good looking new furniture for very reasonable prices. I also have hopes that the newly appointed CEO will be able to significantly lift margins in the grocery segment over the coming years. This is a slow and steady stock, very defensive, with a lot of high quality businesses. Something I’m ready to own for the very long-term. As of today I increase my current exposure from about 4% of NAV to a total 7% position. I continue to rotate my portfolio away from cyclical companies to safer quality havens. Ramirent has been riding the cyclical construction boom in the Nordics. I believe we are seeing the very last legs of that. Especially in Sweden construction could very soon come to a halt with daily articles commenting on the property market. This is something I have analyzed closely myself and I have seen the signs for quite some time. So I’m a bit disappointed that I didn’t manage to exit Ramirent when the stock was trading at least one EUR higher, but here we are. I kept this holding since I started the blog, to avoid the risk of follow this cyclical company all the way down again, it’s time to sell. So as of today’s close I sell my full holding in Ramirent. I have been trying the last few weeks to enter this stock at a more attractive level, but failed to find/time any weakness. Therefore I took an initially smaller position of 4% in this company at today’s close, with the possibility to add in-case I see any short-term share weakness. This is not a cheap stock, but a quality company that I intend to hold for the very long term. It has good exposure to the growing middle-class in Asia. A full analysis will follow at a later date.